Impressed by Sabiha Sumar’s earlier film Khamosh Pani with its strong script and poignant take on Pakistani politics, although admittedly sometime sketchy direction, I was intrigued enough to want to see Good Morning Karachi at the 3rdi film festival despite its rather predictable plot. Intrigued enough, I might add, to pick this film to end my four year drought of not having seen the inside of a theater, I was ready to be more forgiving than usual and even hoped to gain some insight into her creative mind at the Q&A. Alas, all I have is a migraine and an even lesser understanding of her inspiration and work thanks to a disappointing film topped by a lackluster discussion. Based on a novella by Shandana Minhas, Sumar sets the rags to riches story in current day Pakistan against the backdrop of the Benazir Bhutto’s return. The story revolves around an aspiring beautician Rafina (Amna Ilyas) from a working class family allured by the fashion industry and a desire to build a better life. Her only source of support is Rosie Khala (Beo Raana Zafar in an understated performance) who encourages and helps chart her climb to success albeit at a high price. Pitted against familial opposition from her mother (Saba Hamid) and politically active fiancé (Yasir Aqueel) and the ire of conservative mullahs, Rafina navigates her path to modernity. As a canvas Sumar had many colours to choose from and the only thing the film gets right is the verite footage of Karachi, the lower class locations of Akhtar colony as well as the elitist settings. However, Rafina’s clothes at home (sleeveless, halter dresses, way too much skin!) are way off the mark for any lower class working gal and would have had the mullahs knocking down her door post haste. The overuse of English is awkward and inauthentic, the party dance moves (or lack thereof) are just embarrassing and the attempt at a subaltern twist is not only painfully pedestrian but panders to a Western fetishized imagery of freeing women from their burkas and fiery intolerant fundamentalists branding-what else-fire and (un)godly slogans. The entire film flat lines –there is little to no build up to any of the emotional (and a little too dramatic) scenes. What could have been a scathing critique and honest examination of class lines, the elitist bubble and the political feudal and corrupt landscape reveals little more than shallow look at modernity and merrily feeds its own elitist image. Save Rosie Khala, none the characters have any nuance or growth. Amna Ilyas’s acting leaves much to be desired, Atta Yakub’s face is frozen in a permanent leer (for lust or for money or both), and the better actors Saba Hamid, Yasir Aqueel are mostly wasted. It was fun (and not a little ironic) to see Coke studio’s Zoe Viccaji spout dialogues about wanting to get married in virginal whites and you could make a drinking game of spotting other Pakistani celebs (Amina Sheikh, Deepak Perwani, Faisal Qureshi). The script is wafer thin with the pacing and plotting completely off. Other than some inspired images – mirror reflections, the looming billboard- most of the camera work is jittery and headache inducing. Despite this being an insider look at the fashion world it seems cold and distant. The attempt to use the media backdrop -the RJ’s bantering, news reports- fail to make the intended impact and even the soundtrack is forgettable. Worse perhaps is the film makers pronouncement of the very ‘progressive’ Pakistani fashion industry run by women and gay men for whom talent (read an anorexic body) rather than favours gets you an in. In what madam? Skimpy costumes to be leered at and sell products– how very empowering. She also claimed an underlying subversive subtext – which was totally missing in any shape, form or text. The pathetically moderated discussion did nothing to reflect light on anything remotely relevant to the film or the creative process. Misleading billed by the 3rdi film organizers as a conversation between Sabiha Sumar and Anusha Rizvi, it was a complete waste of time. The only intelligent thing about the evening was the questions posed by the audience which, of course, got no intelligent response. Give this one a pass – it’s not worth your time – even in air kisses. Excellent review — and thanks for your kind comment on my post! Thanks! Glad to know we are of the same mind about the film. Other than yours, I haven’t seen any coherent reviews on the film. 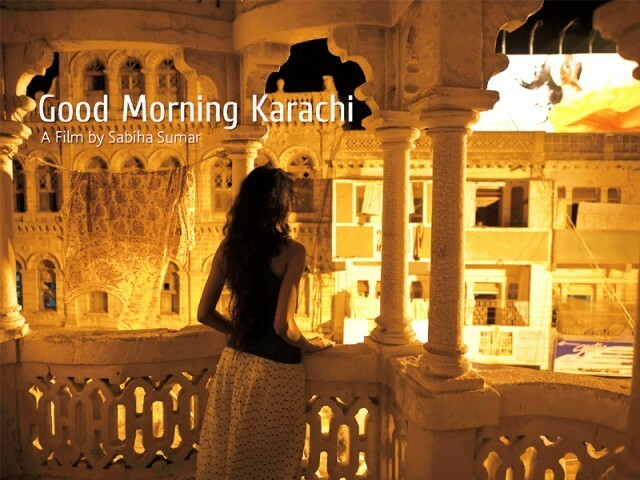 Watched “Good Morning Karachi” at the Mumbai film festival, and sitting just a seat ahead of Sabiha Sumar, I was cringing in my seat (tried hard to be discreet) with frustration and embarrassment. I agree to every word of both the reviews, and felt like you both could read my mind. After the film I also waited curiously for the Q&A, to give the director another chance before writing it off completely (as I was there in the theatre because of Khamosh Paani), but not only was I left disappointed, Ms Sumar even concealed the truth from me. When I questioned her about “Rafina”(I was not aware at that time that she is a famous model in Pakistan) and expressed that she seemed to be a misfit- with her accented english, her dressing sense, her discomfort living and walking around Faisal colony(like an outsider), her fitting into the fashion and modeling world with so much ease and comfort in split second, even having the “perfect walk” and her very poor acting skills. Ms Sumar smirked and seemed irritated and jumped on to saying that Amna Ilyas (“Rafina”) was actually from Faizal colony and she didn’t know a word of english before the film and had nothing to do with modeling. She even self applauded herself for being successful in her portrayal. She even dismissed all the questions about the other issues(which you also pointed out) about the film, saying this is the true picture of Pakistan. I left the theatre feeling could I be so wrong in my judgment? but had to rush for other films playing at the festival, when I later read up on Amna Ilyas little to say I was stunned!! and wondered what did Ms Sumar gain by (what seemed to me) as blatantly lying and misleading an audience!!! and for how long?? Was it desperation, or did I catch her off guard… I don’t know what it was, but I have never felt so wronged before by an artist and so publicly cheated! One thing is for sure, I am going to boycott any film made by her in future and that Good Morning Karachi was an embarrassment and disappointment. Oh my – I thought the film was a disappointment but now she seems to be a disappointment as a person as well. Did she think she wouldn’t be caught out? Amna Ilyas had humble beginnings but she was a poor choice especially since there is such a wealth of talent among their actresses. Rest assured – your judgement was spot on. I fell into a discussion with a few people after the film from a wide section of the desi diaspora – lot of them were Pakistani- and disappointment was the leading consensus. Also, they did not think it was a true representation. Despite my passion for the revival of Pakistani films, I could not push myself to go see this movie just a few blocks away past weekend. The trailer was revealing enough, the acting, the lack of plot, I knew what I was gonna sign up for. No thanks..
you wise man you. I had an inkling that it wouldn’t be all that great but what can I say, I really liked Khamosh Pani – which I would still highly recommend by the way – a strong script goes a long way. There is Zinda Bhaag to look forward too…. Khamosh Paani blew me away. Zinda Bhaag was good too, unconventional structure and ending, interesting take, has little quirks but takes the cake for being brave! Is Zinda Bhaag playing in the Bay area? Yes, I am looking forward to Zinda Bhaag, but again why cast Amna Ilyas in it?? when there are such good actors in the country! Zinda Bhaag was playing in Fremont, at least till a few weeks ago. Did you watch These Birds Walk? No. Unfortunately, this was my first outing to a theater in four years, and I only get one get out of jail free card.